Welcome to a New Year of MG fun! 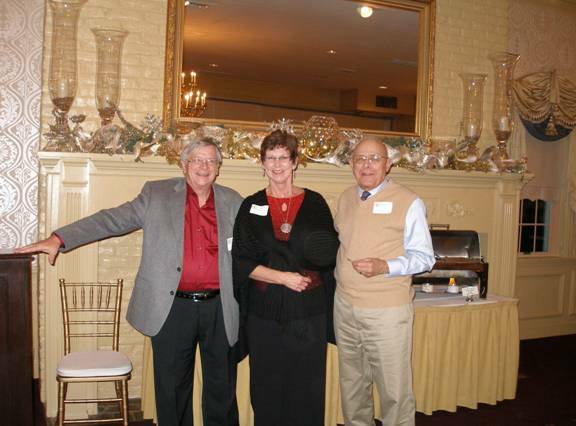 We had our Holiday banquet with close to 50 members present at the Fireside Restaurant on December 3rd. 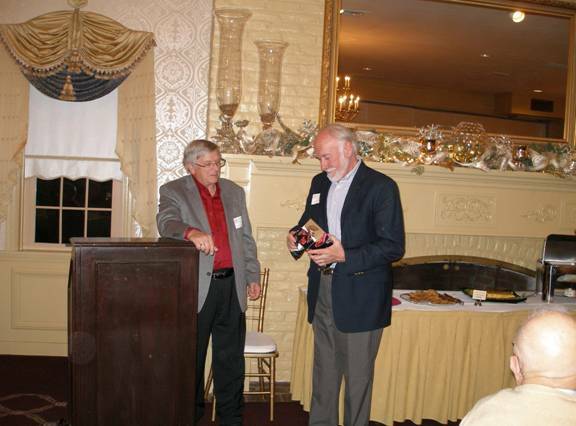 An award for the “Most Active New Member” went to Mike Williams and the ”Enthusiast of the Year” was Charlie Baldwin. A special gift went to Sally Harbold for her service over the years as secretary, president and overseeing other events such as the annual club picnic. LANCO also donated $2,500 to The Central PA Food Bank last year. I would like to thank all, for their great support in 2016, for all the work they do to make British Invade Gettysburg and Taste of Britain car shows a big success. If it was not for those who volunteer, we would not be able to have these events. This gives us the ability to give to other organizations like the Food Bank. So I ask you to please help in 2017. We need you all! I know some of you have left the area to go to warmer weather, so we will see you in a month or two. Larry and I are planning a trip to North Carolina in February - so hang in there. Do some reading or going through parts or planning your British Car schedule for 2017. Check out the events coming up this year and we will see you soon. Even though it was the coldest day of 2017, we had our first meeting of the year on January 8th. Ralph took over for me because I just had cataract surgery the Thursday before. Thanks Ralph. 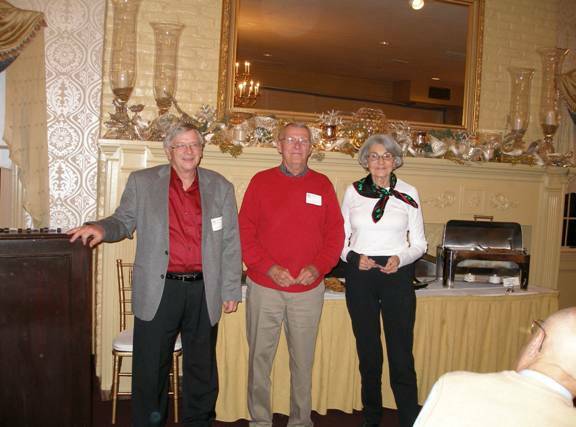 The annual LANCO MG Club Holiday Banquet was held at the Fireside Tavern, Strasburg, PA on Saturday, December 3rd with 46 members in attendance. 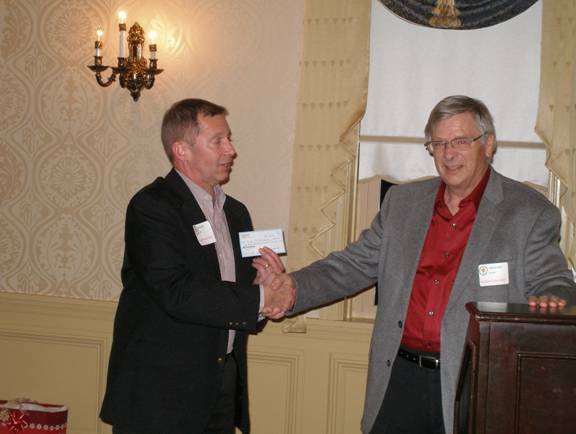 The Central Pennsylvania Food Bank’s Corporate and Foundation Giving Manager, Dave Carl was also in attendance. As the Club did last year, a donation was made to the Central Pennsylvania Food Bank . 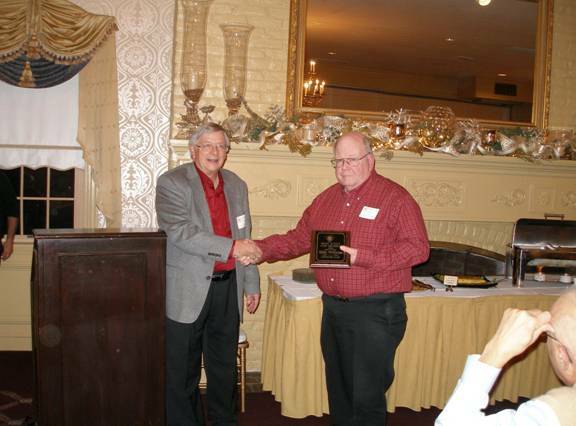 The annual Enthusiast of the Year Award went to Charlie Baldwin. This year’s special awards went to Mike Williams (the “Most Active New Member” Award); Ralph Spayd (the “ President's Plan B ” Award) " for serving as backup for all of Dennis’ absences – and for his adventures with dead batteries (? ); and Sally Harbold (a special Award for her many years (28?) of service to the Club). 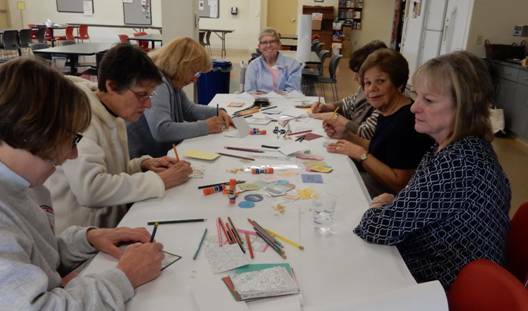 The festivities concluded with a drawing to distribute the “Name Tag Drawing” pot and Joan Martin leading the group in playing “Double Jeopardy” (for food prizes). Another enjoyable end to a successful year! 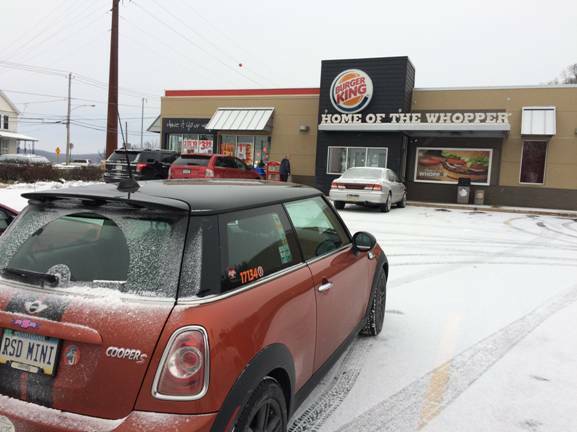 The January 7th (and first “winter”) edition of Coffee, Cars and Conversation was held on a snowy, frigid morning at the Columbia Burger King with four drivers and only one British car in attendance. The dedicated “CC&Cers” included Ralph Spayd, Charlie Baldwin, Skip Partlow and Steve Dellinger. Two hours were spent discussing numerous club-related (and some not club-related) topics. Here’s hoping for better weather (and more attendees) next month! 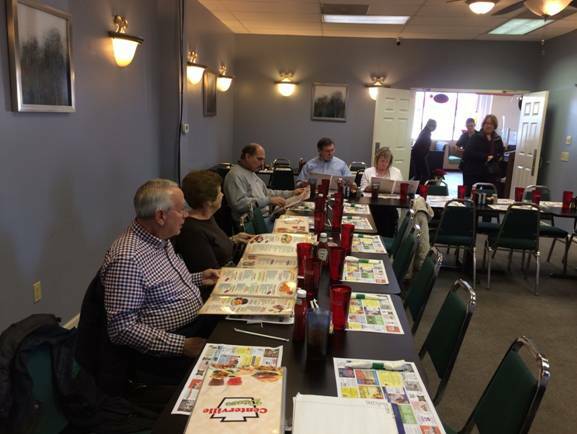 In the absence of new President Gloria Ciarrocca, Ralph Spayd convened the first membership meeting of the New Year at the Centerville Diner in Lancaster, with only thirteen members in attendance. Bitterly cold weather, illnesses, medical procedures and southern vacations all contributed to the sparse crowd. 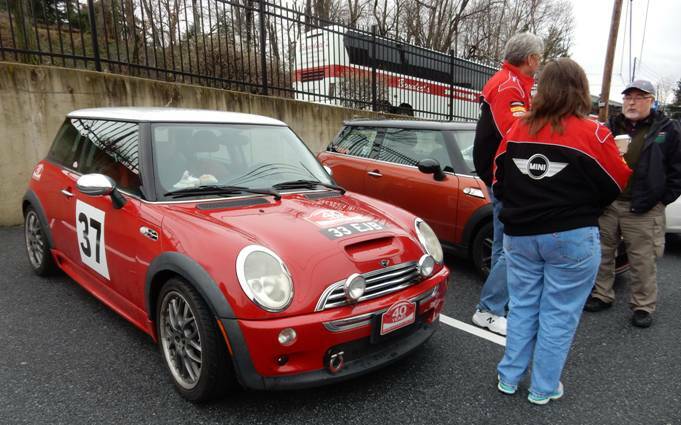 Two new British Cars (MINIs) were also in attendance. We will be holding our membership meetings at the Centerville Diner from January through April this year, as well as in September and November. Minutes from the November 2016 meeting were distributed. The Treasurer was unable to attend, so no Treasurer’s report was presented. Most of the discussion during the meeting focused on the scheduling of events for the year. In addition to regularly scheduled Club meetings and events, and the monthly Coffee, Cars and Conversation, a meeting is proposed in June – to be followed by a “driving tour” of the Gettysburg Battlefield. Several possible road trips were discussed, including a trip to Woodstock, New York, and a trip to Jerry's Classic Cars & Collectibles Museum in Pottsville. After detailing such an ambitious agenda for the upcoming year, Acting President Ralph adjourned the formal meeting – for food and continued conversation. After a week in North Carolina, it’s back to PA winter, although we were lucky enough to miss the snow. I did not make it to the last meeting. Ralph Spayd filled in for me. Thanks Ralph. 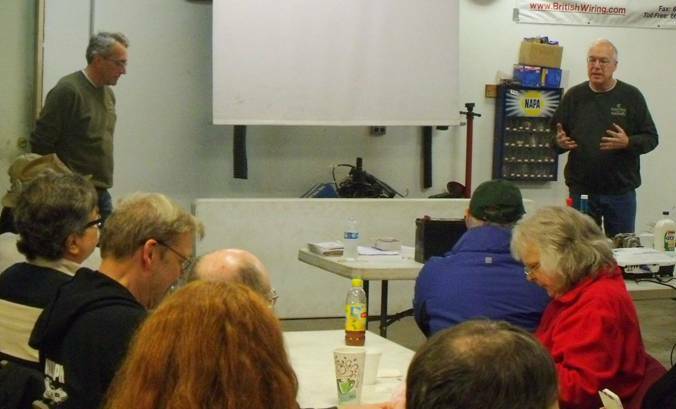 We had a good turnout for the February meeting. Some sad news to report. 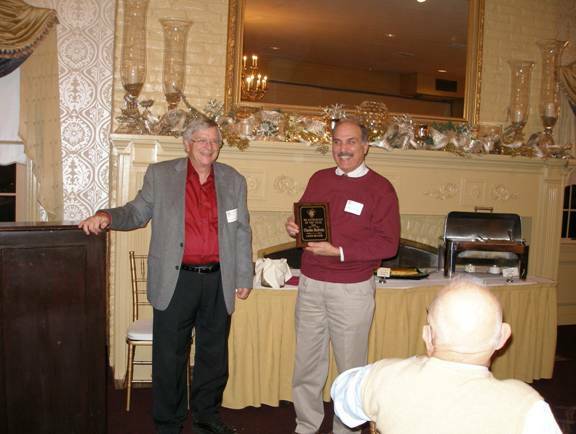 Friday January 27 th, one of our members, Bill Butler passed away. 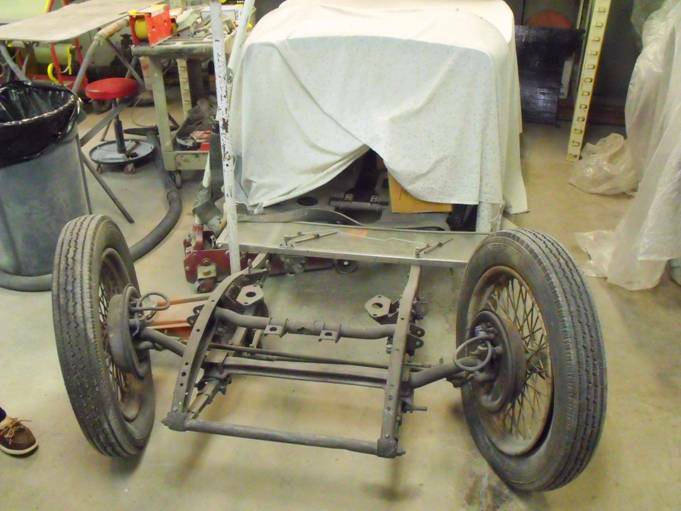 Bill was working on his MGA over the years. His twin brother, Jack Butler also had an MGA, in which they both traveled together to many events. 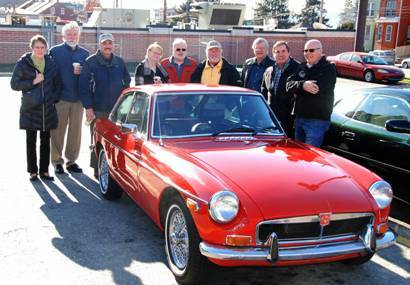 One of their last big trips was to the MG event in Louisville, Kentucky this past June. The rest of the LANCO group who went all had a great time with Bill - going on the Whiskey tour, and the Corvette factory and museum tour. Bill also was a volunteer at the “A Taste of Britain” show. He will be missed. August 5th - Pennypacker Mills British Car Show in Schwenksville, PA.
We are looking at possible trips to the Yuengling Brewery and Jerry’s Classic Cars and Collectibles in Pottsville. See you at the next LANCO meeting at the Centerville Diner, on March 12 th at 3 PM. Remember the days are staying lighter longer and Spring is on its way. We held our second CCC winter event at the Burger King in Columbia. 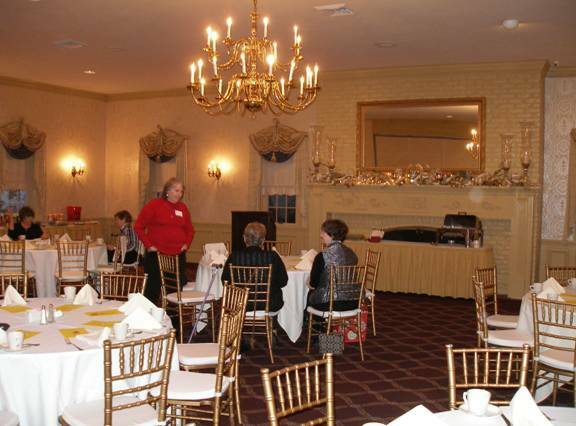 It’s a great venue to meet during the cold winter months. This meeting was a sad event as we were gathering to head over to Bill Butler’s viewing/funeral. Bill was a long time LANCO member and an avid MGA guy. Along with his brother Jack, they helped keep the marque alive. Bill will be missed by his friends at LANCO and the British car community. All of this gets me to thinking about life in general. As I get older, I’m fascinated about the chain of events that take place in our lives. 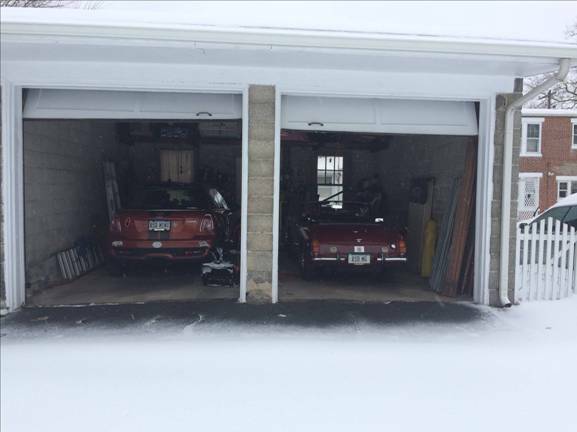 My good fortune way back in 1967 was to purchase my first MGB and become an avid fan of British cars. Fast forward past kids, jobs, family stuff, etc., etc. to 10 plus years ago when I joined the LANCO MG club. Sandy and I met likeminded individuals with whom we formed friendships. One of those friendships was with Bill Butler. What really fascinates me is a random event in 1967 that led me to a cold but clear day in February 2017 to say good bye to a good friend with whom I shared a common bond. As the Grateful Dead sang “What a long strange trip it’s been”. And it really is. Think back on all the coincidences in your life and where they did or will lead you. Keep your eyes and mind open to the future. Tune out the static and cherish what we all have …. each other. 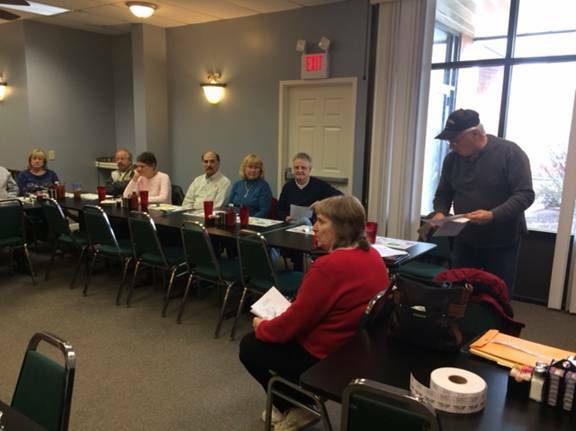 New President Gloria Ciarrocca convened her first membership meeting of the New Year at the Centerville Diner in Lancaster, with twenty members in attendance. Three British Cars (all new MINIs) were also in attendance. Minutes from the January 2017 meeting were distributed, and the Treasurer’s report was presented. Committee reports on the status of the BIG and A Taste of Britain shows were presented, along with updates on membership, the website, and the Club Picnic in August. Most of the discussion during the meeting focused on the scheduling of upcoming events. President Gloria then adjourned the formal meeting – for food and continued conversation. I know it’s hard to believe, but spring really is here finally [this was written a day before a major March snowstorm]. We had a good turnout for the March meeting, with 20 people in attendance and three modern MINIs and an Aston Martin driven. 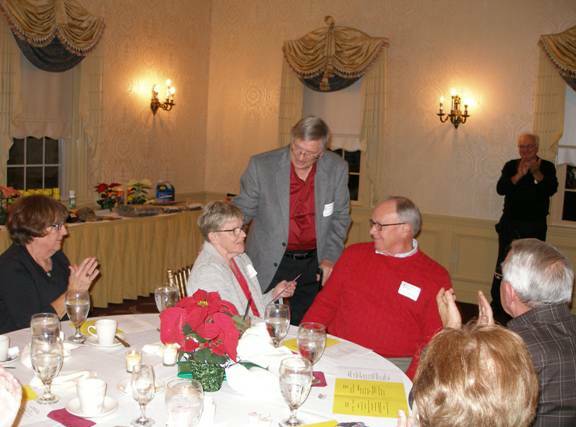 Those in attendance included Gloria and Larry Ciarrocca, Jon and Edie Arndt, Steve Dellinger, Deb Eckert, Jack Butler, Andy and Kay Myers, Al Little, Bob Arlotto, Lou Ann and John Mylott, Pam and Bob Preston, Bruce and Sue Hurley, Cor Engelen, Margaret Sultner and Charlie Baldwin. We discussed upcoming events, which you will find listed below and on our web site. Updates were given on BIG (July 9) and TOB (August 27). Bob Arlotto brought the memorial banner for Ralph Eriksen to be displayed during BIG. Ralph’s wife and daughter will be present for the dedication. If you are interested in volunteering for BIG or TOB day of show, we could use your help. You can email Bob Arlotto (Bob_arlotto@yahoo.com) or Larry Ciarrocca (Mg1lanco @comcast.net). There will be NO April meeting because it would fall on Palm Sunday. The next meeting will be in Marietta on May 7. On that day, there will be a tech session at Tom Hertzog’s shop in Maytown (European Imports) and the ladies will have a craft session at LEPCO. Following both sessions, there will be a meeting at LEPCO at 4:30. The club will order pizzas and soda. If you would like to bring a dessert that would be great. After the June CC&C gathering LANCO will have a river drive ending up at the Moon Dancer Winery. Check our Upcoming events for dates for meetings and CC&C. We will be listing British car shows for this summer. Also check the LANCO web site for information. 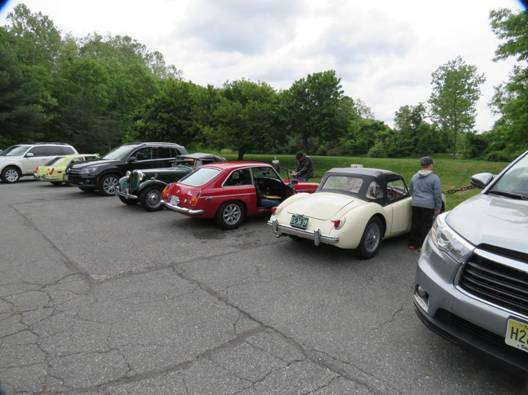 June 3 – Cars and Motorcycles of England, Oakbourne Mansion, Westtown. 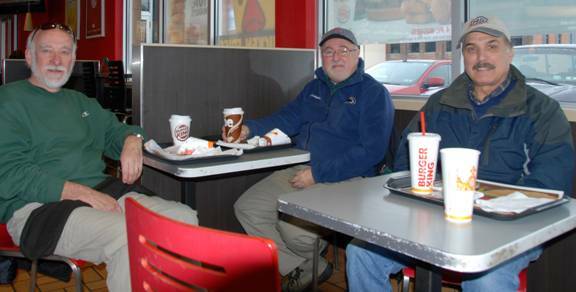 PA.
We held our third CCC winter event at the Burger King in Columbia. With the mild winter we’ve enjoyed (well at least I have) you’d think we could meet outside, but nooooo … it was actually winter today and the Burger King seemed like a very good idea. The event was well attended by nine hardy folks with one British car in attendance. Obviously, his heater works…. trust me it does, nice car Jack! The conversation was good, the coffee was hot and we exchanged stories of past wins and losses on the field of British car combat - but, who is really keeping score. Now, depending on the weather, we will make the switch to the Turkey Hill Experience in April and meet outside in the parking lot. But based on the crazy weather patterns this year we might be meeting at the Burger King again. There is really no reason to suffer. 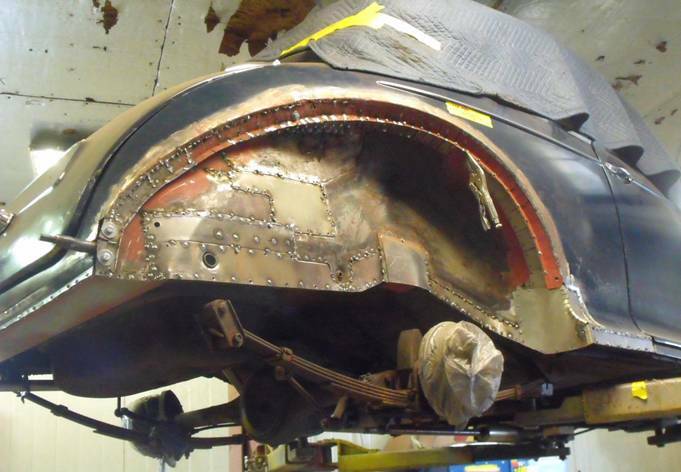 Paul shared his Jag painting update and the unique way they disconnected his wiring harness, humm. The good news is the paint is great and they will make it right. Bruce had us look at the wood dash overlay he’s working on for his Bugeye. It was a really tough choice and I’m not sure Bruce got an answer; more of a split decision. Either way Bruce did some excellent work. Looks like the retirement thing is working well!! The really exciting news was the customization Charlie did to his Subaru……I’ll let him explain that one. Remember, no fake news here I only report the facts……see you in April, be flexible as we might meet indoors. There is a phenomenon we’ve all experienced at some point during our British car ownership. 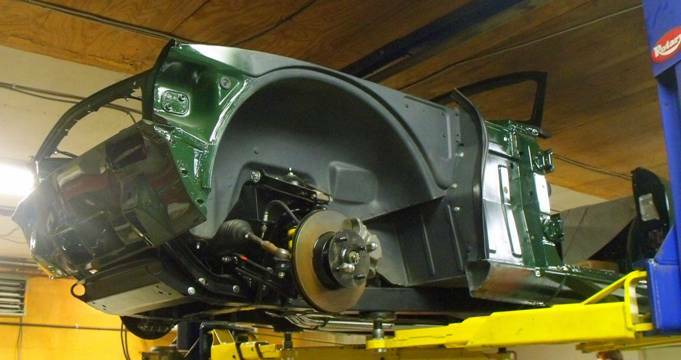 It’s the strange, but ever real dilemma of British Car Shrinkage or BCS. It is a slow but insidious process of your car getting smaller as you get older. I know firsthand how disturbing and embarrassing the shame of BCS can be. It’s a gradual process that goes unnoticed during your early years of British car ownership. It is not just the problem of a particular marque, but affects all British cars with the exception of Bentleys and possibly Rolls Royce. I do not consider Land Rovers in this class and will not be discussing them as they have found a way to neutralize the effect, but chose not to share the antidote. A very sad thing indeed. 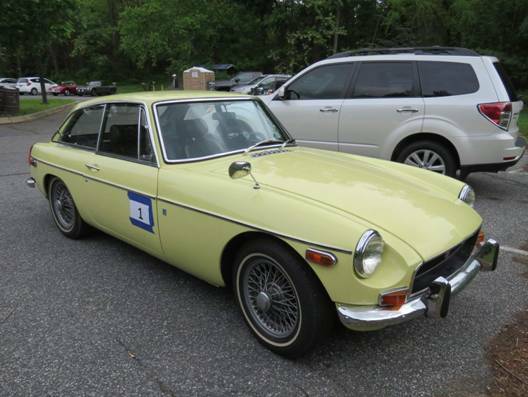 My experience with British cars started in 1967 at the age of 18 when I got my first MGB. There was absolutely no problem or BCS with the car, but I should have been more observant or cognizant of the problem as it had started to affect my car as dad would announce, “damn this thing is hard to get into” …. obviously, the insidious effects had started. In my youthful exuberance I chose to overlook the situation. OMG, my car WAS starting to shrink! Fast forward 20 years and I began to notice something about my car was different. Yes, yes indeed it had begun to shrink. In fact, I had contaminated my wardrobe with BCS as my pants has also begun to shrink. My god, my dad was right! Several years ago, I purchase a 1977 TVR and it was already contaminated and had shrunk. As I applied logic to all this, I determined the problem has gone on unnoticed for years as my first MGB was a 1965 and the problem still existed in 1977. Just to verify my hypothesis and confirm my suspicion I bought a 1959 Bugeye to restore and sadly it too was affected by BCS. So, I know the problem dates back to at least 1959. My personal experience and observation shows this problem spans a minimum of 20 years. Why is the government not addressing this problem? My whole house is now contaminated with BCS as it’s affected my lazy boy and other household goods. Surprisingly the toilet seems to be immune? I am surprised that I can’t park two BCS affected cars in the same area as a single unaffected BCS car, but do not believe this is significant and only antidotal. I do not know of any cure for BCS and have chosen to live with the symptoms and effects. I would like to form a support group as I noticed in the club that some members could use a supporter. And to quote my dad “damn this thing is hard to get into”! There was no April meeting because it fell on Palm Sunday. We did have a Coffee, Cars and Conversation meeting at Turkey Hill Experience. The same day, Ralph Spayd and Charlie Baldwin went to the Triumph Rescue tech session. 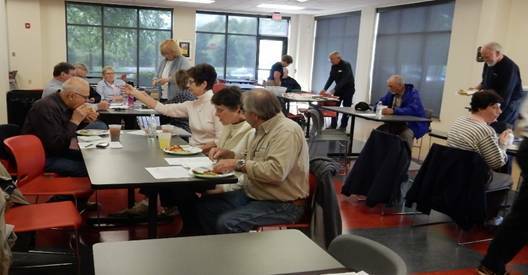 The next Coffee, Cars and Conversation (CC&C) will be held on May 6th and the next Club meeting will be in Marietta on May 7th. A Tech Session will be held at Tom Hertzog’s European Imports at 1:30 PM (Maytown) and the Ladies will meet at LEPCO, Rt. 441 (Marietta) and have a craft session. Following both sessions, there will be a meeting at LEPCO at 4:30 PM. The Club will order pizzas and soda. If you would like to bring a dessert that would be great. If you have anything MG (British car) related for sale, bring it to the meeting. We are coming into MG season and there are a lot of events in the next few months. Import Carlisle is May19-21. I understand LANCO will share a tent Saturday with other local MG clubs. The annual Covered Bridge Tour is scheduled for Sunday, May 21st. This year, we have invited the Volvo club. The Tour will start at the Donegal Intermediate School (Rt. 441 in Marietta) at 11:30 AM. And don’t forget “Drive your British Car Week” (May 27 - June 4). Get out and drive your cars and show everyone what beauties are still around . Who knows, you just might spark someone’s interest to own a great sports car. After the June CC&C gathering on June 3rd, LANCO will have a river drive ending up at Moon Dancer Winery. Sunday June 4th is the Original British Car Day at Lilypons, Adamstown, MD. 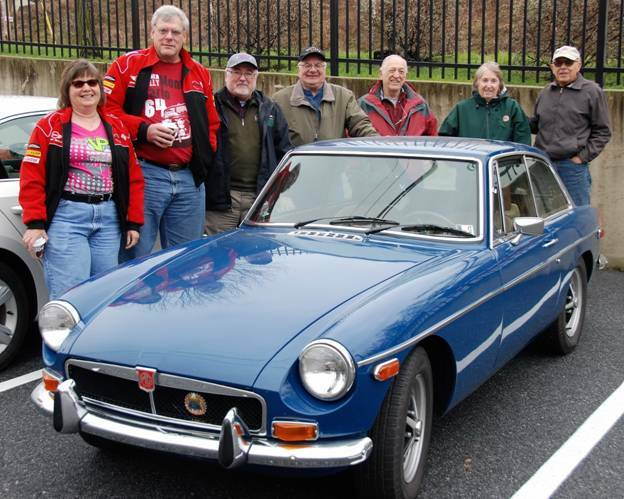 June 11th is the Keystone Region MG Club’s “ British Motorcar Gathering” in Hellertown, PA.
July 15 & 16 – Pittsburgh Vintage Grand Prix and British Car Show, Schenley Park, Pittsburgh, PA (Jon Arndt is coordinating hotel reservations for this event. If you want more information email him at joninsman@comcast.net ). Another urban myth busted…yes, there is such a thing as a free lunch! And, it’s located in Bally, PA at Triumph Rescue! 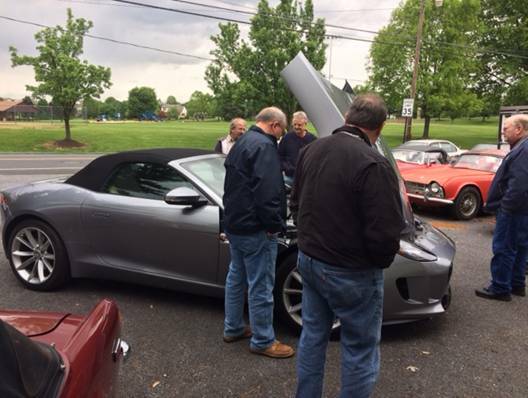 A group of us from LANCO “hungry” for knowledge ... (did ya get the pun) … trekked to Triumph Rescue on April 4th to attend the annual tech session sponsored by Matt and crew at Triumph Rescue. I’m guessing, but there were well over 100 people attending the session. It is not only a great and informative tech session, but truly a very gracious act that Matt and company provided each year. This year lots of information was shared regarding how to help keep our LBC’s on the road. Which as we all know is getting to be an increasing difficult job. 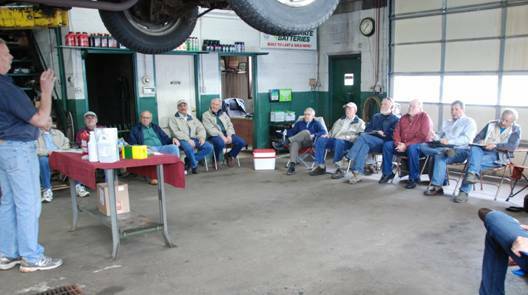 Not just as we as drivers age, but parts/quality, gas, tires and the list just goes on and on! But, if you need help in keeping your car on the road, Triumph Rescue can certainly assist with the job. In fact, our own Bruce D. has his car there for some work. It was on the lift and actively being worked on. I’m not sure for what, but from what I saw, it looked like Bruce was having them add rust to his car to reduce the weight……. Speaking of reducing weight, they also provide coffee and donuts to start the day. What a winning combo, coffee, cars and good info. Tough to beat that in Belly, I mean Bally, PA! Remember to check out our website at www.lancomgclub.com and mark your calendars for the upcoming events. We have some really exciting events planned for 2017. No free lunches, but some really nice events. By the time you get this issue, all the May events will be behind us. I hope Import Carlisle had nice weather. 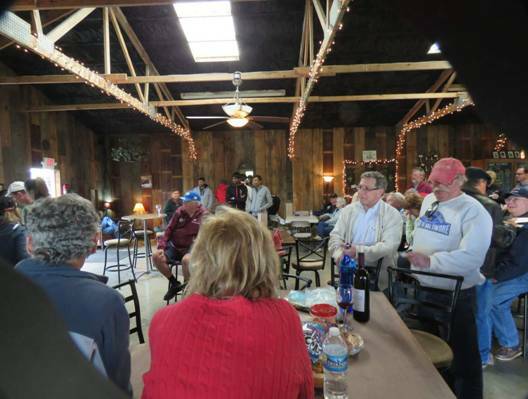 Hopefully, the Covered Bridge Tour on May 21st had good weather and a great turnout. Finally, it looks like we might get some nice MG driving weather. There are lots of events so keep informed. We had our monthly meeting at LEPCO, where the ladies did crafts (colored cards) and the guys went to the tech session at European Imports. LANCO bought pizza for everyone attending the meeting. We had one new member join. I was not here for CC&C; Carol Blevins and I were enjoying Colorado. When we landed, it was snowing but the rest of the week was nice. I finally saw two moose right outside our condo - and to think of all those years of going to Stowe and not seeing one. Dennis Blevins and Eric Salminen put on the “Get the Dust Off” rally (see the article in this issue). The next CC&C will be on June 3 rd. After the June CC&C gathering, LANCO will have a river drive, ending up at Moon Dancer Winery. The next Club meeting will be June 11 th at 1:00 PM at the Cross Keys Diner on Route 30 in New Oxford, PA. There will be a short meeting and then Skip Partlow will conduct a tour of the Gettysburg Battlefield. The AH club and Triumph club have been invited to join us. Check our Upcoming events for dates for meetings and CCC. We will be listing British car shows for this summer. Also, check the LANCO web site for information. Jon Arndt is coordinating reservations for the trip to the Pittsburgh Vintage Grand Prix in July. If you want more information email him at joninsman@comcast.net He has reserved five rooms. There is no extra fee for parking this year. Check out our web site for more details. See you down the road, top down and wind blowing in your hair! 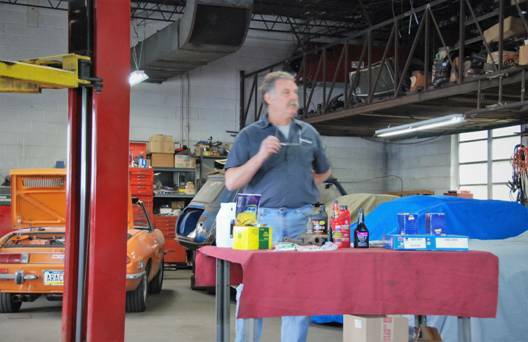 A big THANK YOU goes out to Tom Hertzog at European Imports for graciously hosting our club’s annual tech session. Tom’s job is made somewhat easier by all the suggestions we provide ... yeah, right!! But seriously, Tom’s creative bent comes out and provides us with a wealth of information. Let me summarize: condensers; good red rotors; ZDDP; Stabil; new parts that ain’t like the old ones; hydraulics that won’t make Archimedes proud; brake/break hoses and DOT compliance; body trim that needs a shim and last but not least regular maintenance or the lack there of and not to be forgotten, tire date codes! Why in the world are you driving these LBC’s, do you have a death wish? No, not really! Let’s recap, and I’ll speak from an MGB perspective as that’s what I’m most familiar with. Do you really think BL or whoever they were at the time planned to keep these “economy” cars on the road from 54 to at best 37 years later? Are there parts suppliers falling all over themselves to supply parts? I think not. Tom’s point to all this is quite simple. Drive your cars and enjoy them. Keep them on the road. But, be mindful of and aware of your car’s condition. The big parts suppliers do a really good job supplying parts for us to keep em’ rolling, but it’s not the good old glory days of the British Car Empire. You may have to replace that master cylinder more often than in the past. Some electronic parts may not be up to snuff, but don’t suffer in silence. Speak up and feed this info back to the Toms of the world so they can make our collective case. It’s not a perfect world we live in, but we don’t have to become shrinking violets either. If you’re like me, you see your doctors much more then you did 25 years ago. Same goes for your LBC. Keep it moving, but understand its going take more attention than it did 25 years ago. Tom’s prescription to us all is enjoy your car, put the top down and it just might lower you blood pressure. May 7, 2017 - Joppa, MD. 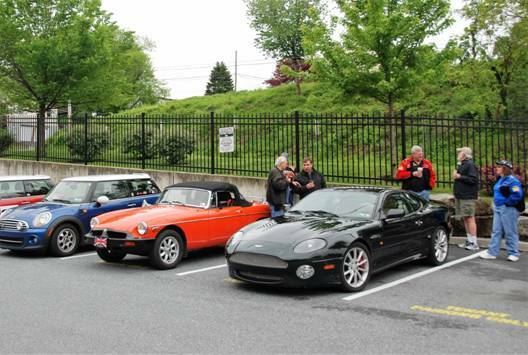 Twenty-nine teams from Philadelphia, New Jersey and down to northern Virginia competed in the 28th running of the “Get the Dust Off” rally -sanctioned by the Washington DC region of the Sports Car Club of America and hosted by the MG’s of Baltimore club (MGOB). 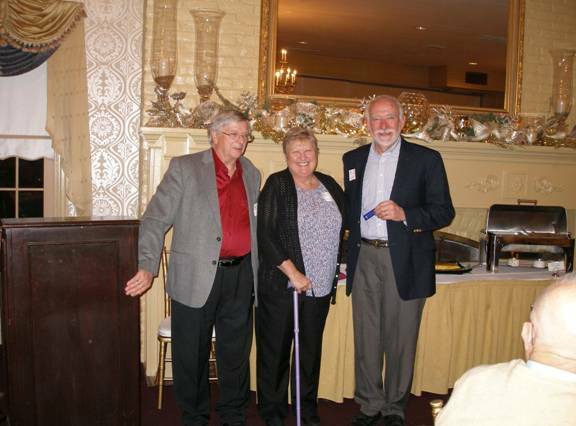 Rallymasters were once again Eric Salminen and Dennis Blevins – now known as the “3-Stick Rally Team” (a cane for Dennis, crutches for Eric) with able assistance from co-chair Chris Horant of “Triumphs around the Chesapeake” (TRAC). Rally vehicles included everything from a 2016 Honda Civic to a 1952 MG TD. Beginning at Mariner Point Park in Joppa, MD and finishing at the Dejon Vineyards and Winery in Hydes, MD, the rally route covered seventy miles of scenic country roads of Baltimore and Harford counties of Maryland and southern York County in Pennsylvania. LANCO (and MGs of Baltimore) members Alan and Carol Tucker took fourth place in the Historic-II class piloting their Primrose MGB-GT (previously owned by LANCO MG members Ralph Spayd and Jack Butler). In all, twenty teams were awarded forty bottles of wine for their final placement with in the eight classes of competition. Alex Ollerman and Sarah Bowles took home the $100 winery gift certificate for finishing with the lowest score among the MGOB teams. A GOOD TIME was had by all.